With dental implants you can replace missing teeth with ones that look and feel like your own. We love seeing people regain their confidence when they have a full, working set of teeth. This is an advanced procedure that my office specializes in. In this office, all of your visits, tests and procedures happen right here, so you don’t have to see different dentists. 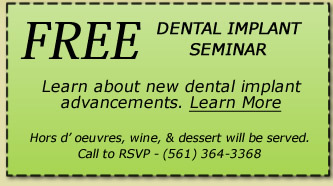 Learn about the types of dental implants and benefits of dental implants. We can also stabilize loose dentures that normally won’t stay in place without adhesives. Patients tell me they can eat foods they’ve been avoiding and talk without worry after this procedure, which can be done in one visit! For dental implants in Boynton Beach, call the office now to schedule an appointment and get ready to start smiling again!